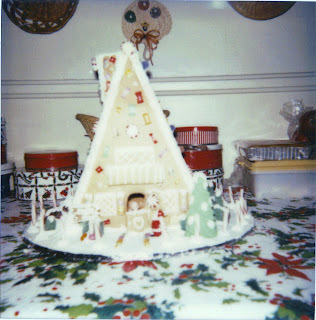 Every Christmas my mom would make gingerbread houses. She would shop for different candies to use on them way before Christmas. She was such a talented lady. It was fun to watch them get bigger and fancier as the years passed. These are only a few that she has done, the only ones I could find quickly. 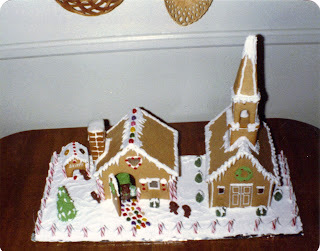 In the one with the church she even made a dog house for her beloved "Skippy." I love the thought of her being with her precious furbaby as well as with mine. Every year, I hear this weird sounding horn outside my house with sirens and lo and behold, it is santa coming to visit our neighborhood. Our volunteer fire department where I live keeps this tradition alive and well. I feel just like a kid when I hear those familiar sounds coming down my street. I know immediately it must be santa! 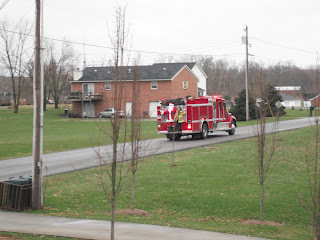 Sure enough...there he is on the back of the big bright red fire truck. Next year I'm gonna have to tell them to slow down coz I couldn't get a very good picture. They hand out treats to the neighborhood kids also. Gotta love living in a small rural town! 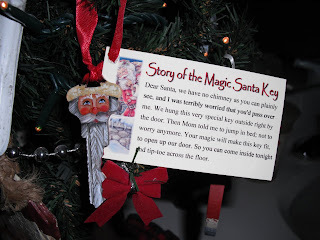 As promised, here are the pictures of the three ornaments I purchased this year for my santa tree. It was such a delight to get them all on the same day! I felt like it was Christmas already! Like I've said before, I love anything santa. I think they are wonderful...hope you enjoy them too. 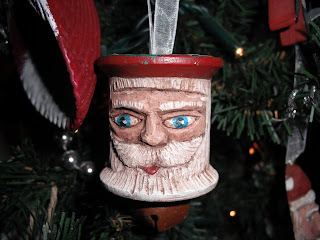 I may have to redo the santa's eyes on the wooden spool as sometimes when I look at it, it looks like santa is mad or something...not sure if I will do that or not. I loved the antique spool it was carved on. 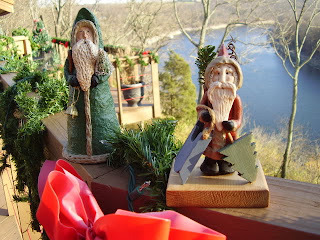 I'm going to keep out the carved ones this entire new year so that they will inspire me to try my hand at carving. 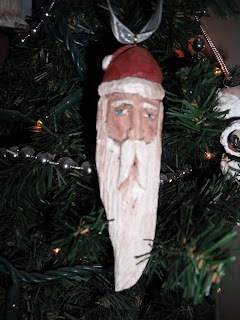 That is my new year's resolution, to learn how to carve, whether it be with actual carving tools or with my dremel. I have already bought a book to help me with this new venture! Pray I don't cut off a finger! Ugh...you will find that I absolutely dread Mondays as I cherish my weekends! I have worked for 36 years of my life and I'm pretty tired of it but we must do what we have to do don't we? Anyway, had a very busy weekend, mostly crafting, trying to get out my orders. I finally finished my order of 24 lightbulb ornaments last night at 9:00 p.m. YEAAA! Above are the three different ornaments I finished up this weekend! I am going to have to find a different fur to use on my santa and grinch bulbs as I have to trim the boas I currently use and it takes me hours to trim them up to look like anything. Anyhow, I won't be painting anymore things that requires boas until next year. They didn't seem so bad trimming them one here and there but to have to do 20 in one sitting it was a bit too much...and not to mention how that stuff flies everywhere. I guess I will be painting until Christmas Eve. Good thing I'm on vacation the week before Christmas. 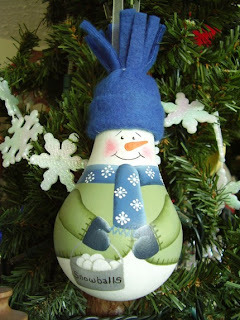 I had intended to share with you a picture of 3 ornaments I bought for myself this year but have not uploaded the pictures from my camera yet...haven't had time! I will try to share those with you this week. In the meantime...gotta make time for eating ya know so here is a new recipe I tried on Sunday for breakfast...it turned out really good. Plus it was such fun as it was being more creative than my normal breakfasts...I always love creativity! Thought I would share it with ya. Bread an egg into each hole. Sprinkle with the cheese, bacon, peppers and onion. Bake at 450° for 8-10 minutes or until the eggs are completely set. Yield: 6 servings. Just cut with your pizza cutter, making sure one egg is on one slice. I know...two blogs in one day...maybe this one will make up for the one that I don't get written on the weekend...busy, busy, busy, time of the year! Anyway, I made this new soup recipe this week and wanted to share it with ya! I love trying new soup recipes and I especially LOVE buffalo chicken! This was quite yummo! You might wanna double it if you want to serve more than two people. Enjoy! Boil and cook chicken. Saute' onion and celery in butter until tender. Stir in flour until smooth, slowly stir in milk and broth. Stir in remaining ingredients and simmer, stirring occasionally. It says to serve with Red Lobster Cheddar Biscuits. I served it with those yummy Sister Schubert's yeast rolls. That song just makes me so sad this time of the year and everytime I hear it I have to change the station on the radio or make a mad dash out of the stores. It reminds me so much of my many Christmas pasts with my mom and grandmother who was like my second mom. I lost my mom 7 years ago and my grandmother 9 years ago and Christmases have never been the same. I can remember pulling onto my mom's street on Christmas Eve after I got married and seeing her decorations but her windows would just sparkle and have a twinkle to them...such a warm welcoming sight. I could not wait to get inside to spend time with my family and especially her. She was the most special person on this earth to me and the rest of my family. I feel so lucky to have had her for a mom and such a loving family. My grandmother was the same, she would do anything for anyone and I am so lucky to have had her in my life. 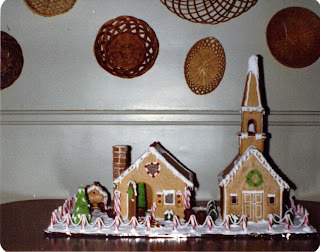 In my blog, from time to time I will share with you things that my mom has made over the years. She was without a doubt the most creative, talented person I know or could ever know. And she would make people things and give them away all through the year. At her funeral almost every person that came up to me would mention something that my mom had made them whether it be a craft or homemade bread or food in general. Sharing these things with you make her seem a bit closer to me. Thanks for reading! This is a picture of two santas she made for me. Since I collect santas and am a huge santa lover she was always making me or buying me anything santa. 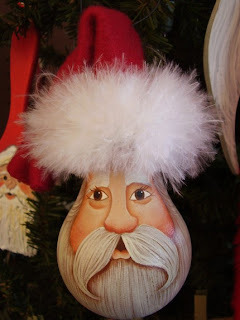 These santas are made out of clay and then painted. She and I loved sculpting bread dough together. In the future I will share some of those bread dough ornie beauties with you. Wow! Can you believe it is only 16 days away? 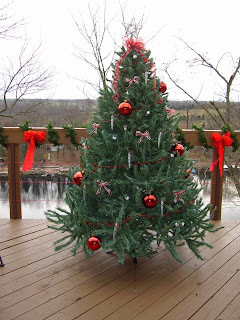 I am happy to report that I did manage to get my home decorated a week before Thanksgiving and it is a good thing since I have been swamped with orders from co-workers and friends. 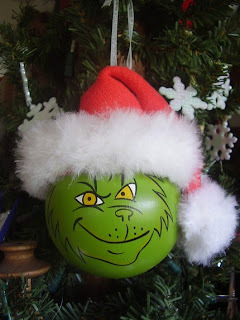 I have to paint "at least" 50 ornaments before Christmas so I feel like a little elf right now. I'm making fairly good progress. I am taking off work the week of Christmas so I have given myself the deadline of December 18th to be finished with orders...gosh, only if I had an elf to help me! 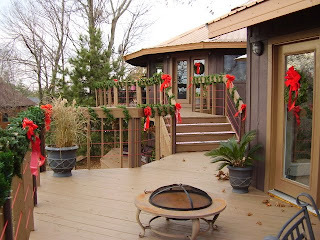 Anyway, wanted to share a pic or two of what my Christmas is looking like at the lake! I hope to get back on here before them but who knows? If not, please have a wonderful Christmas!